Aromatherapy Associates have a great selection of Christmas gifts this year, I've never tried the brand before but can tell from reading great blog reviews and reading about the products I can tell they are a good company and use the best ingredients. Little Star gift set is a must for bath fans! There's nothing more relaxing than a nice hot bath with beautiful scented bath oil and some pretty candles lit which leads me onto the next gift! 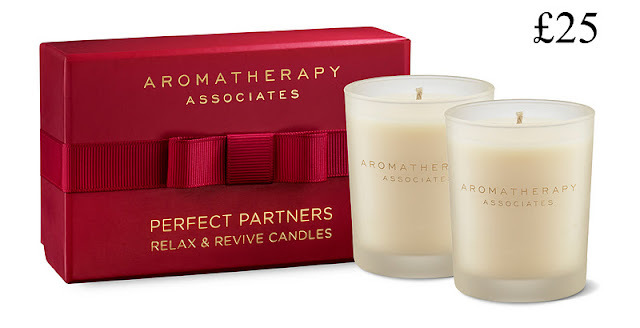 Perfect Partners like most of my readers I'm a true candle fan and love having a candle lit whether it be day time or evening. For me it instantly gives that calming relaxing feeling. This would be a great gift for candle fans out there. Each candle burns for 20hrs so this set is well worth the pennies especially the beautiful aroma and ingredients which have been used. Renew Rose Body Duo sounds right up my street, I'm a Rose addict and this would be very much welcomed under my Christmas tree! Damask Rose water is amazing and I can only predict this duo to be the same. Have you tried Aromatherapy Associates? Please share with me your favourite products.